News: Shakeaway Milkshake Bar Coming to the U.S.
Baskin-Robbins is offering a slew of pumpkin-flavored items plus new Whoopie Pies in addition to Trick Oreo Treat, this month's Flavor of the Month. Trick Oreo Treat ice cream features orange creme-filled Oreo cookie, Baby Ruth, and Butterfinger candy pieces mixed into vanilla ice cream. It's available in a cup, cone, milkshake, pint, or quart. 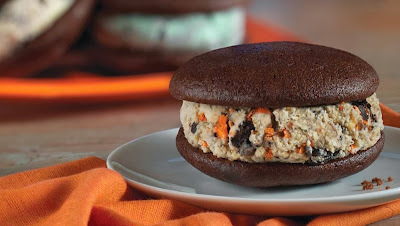 The new, limited-time ice cream Whoopie Pies are made with a choice of ice cream sandwiched between two cookie-shaped chocolate cakes. Whoopie Pie cake pieces can also be purchased to take home with a pint or quart of ice cream to assemble at home. To help celebrate Halloween, Baskin-Robbins is offering a duo of Halloween-themed cakes: the jack-o-lantern-shaped Pumpkin Patch Cake and Haunted House Cake. And, of course since it's fall, Baskin-Robbins is serving Pumpkin Pie ice cream, milkshakes, and Cappuccino Blasts. that whoopie pie looks like it has tuna salad between it, not ice cream...not a good thing!